Weight Loss and Diet Plans | Your Health. Your Lifestyle. A healthy body weight is one that is right for you. It is a weight that reduces your risk of disease and allows you to look and feel good. There are several ways to determine your healthy weight, one of them is Body Mass Index (BMI). For most people, the BMI provide a fairly accurate estimation of body fat based on height and weight. It’s used most commonly to define “overweigh” and “obese”. To calculate your BMI and the calories you need each day, follow the steps below. Step 1: Find your height in the left-hand column and your weight in the corresponding row. 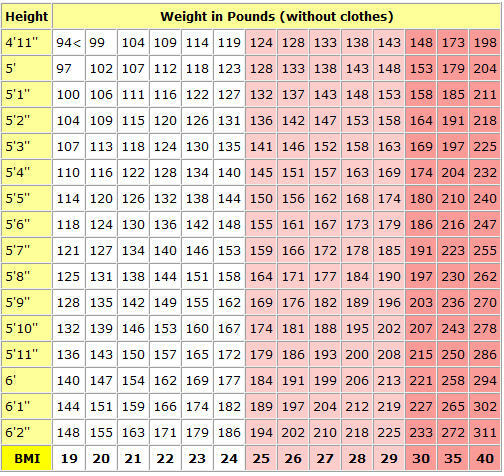 Step 2: The number in the bottom row is the BMI for your height and weight rounded to the nearest pound. Step 3: If your BMI is 25 or above, you may need to lose weight. Find recipes that are low in fat and calories and full of flavor. The nutrition information provided for each recipe helps you keep track of your daily food intake and see how a dish fits into your meal plan. The nutrition information is for one serving of the finished dish. Try to locate the amounts per serving of fat, saturated fat, cholesterol , sodium, total carbohydrates, fiber, and protein on each recipe. Many formulas calculate how many calories you need each day to maintain your current weight or to lose weight. Here is a quick and easy way to determine approximately how many calories you need each day to maintain your present body weight and how many calories you need to lose weight. To Maintain Weight: Multiply your weight in pounds by 15 if you’re moderately active (you do housework, gardening, and brisk walking for 30 to 60 minutes most days) or by 13 if you’re sedentary (you sit all day with no planned exercise). For example, if you’re moderately active and weigh 200 pounds, your average intake is 3,000 calories per day (200 x 15). To Lose Weight: You need to take in fewer calories than you currently do. For example, to lose 1 pound per week you need to reduce your calories by 500 per day. That’s because 3,500 calories (500 calories x 7 days) equals 1 pound of body fat. Losing 1 to 2 pounds a week is considered a healthy rate of weight loss. If that’s too much calculating for you, just consume fewer calories than you do now. Most women lose weight if they take in 1,200 to 1,500 calories per day and most men lose weight if they consume between 1,600 to 1,800 calories per day. Skipping meals is often associated with increase in total calories intake because people who skip meal tend to overeat by impulsive snacking or eating more at the next meals. Research shows that consumption of four to five meals/snacks per day including breakfast is associated with reduced or no obesity risk. Also, studies show that skipping breakfast is associated with higher BMI and increased obesity risk. It is recommended that total caloric intake should be distributed throughout the day, with the consumption of four to five meals/snacks a day including breakfast. Supplements are not regulated like prescription and over-the-counter medication by U.S. Food and Drug Administration (FDA). FDA only takes action against unsafe dietary supplement products. It is the manufacturer’s responsibility to ensure their dietary supplement is safe before it is marketed. Often times these products are not tested scientifically to prove that they are safe or effective. The effectiveness and the safety of using such products are always questionable. For example, Ma huang (Ephedra) is claimed to have benefits such as weight loss, increased lean body mass and increases energy. Studies showed that Ma huang alone does not result in weight loss, unless combined with caffeine plus a calorie-restricted diet. Because Ma huang is a central nervous system (CNS) stimulant, it increases blood pressure and heart rate. 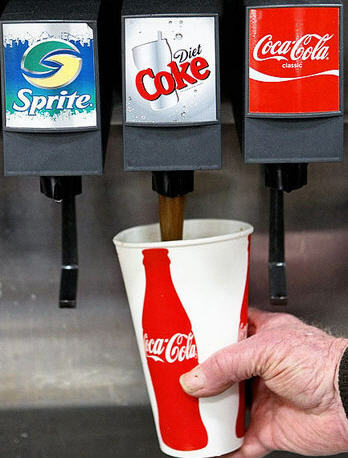 It is especially hazardous to people weight heart ailments, diabetes, hypertension, and thyroid conditions. 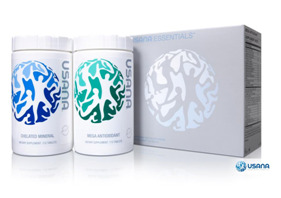 Other examples of “natural” products that are claimed to promote weight loss but without supportive scientific evidences include Senna, Chitosan, Garcinia Cambogia. So, how to lose weight effectively? Losing weight requires calorie deficit. One pond of body fat is equal to about 3,500 calories. An energy deficit of 500-1,000 calories per day can result a weight loss of 1-2 pounds per week. It is important to reduce the total calorie with a balanced diet including healthy food choices and appropriate portions. In addition to diet, physical activity should also be included in the weight loss plan to help your body burn the calories in order to maintain a healthier weight. According to the ADA’s position article on weight management; “successful weight management requires a lifelong commitment to healthful lifestyle behaviors emphasizing sustainable and enjoyable eating practices and daily physical activity”. Weight loss should be a long term commitment of healthy lifestyle behaviors rather than just a quick fix. It is necessary to establish healthy eating habits and physical activity routines that meet your needs and are maintainable for life. What about to get slimmer by eating what Mother Nature has to offer to us? Obesity is increasing. It’s not only a concern of rich countries, because it’s an obvious fact also in developing countries. This problem is growing so fast, that none of hypothesis studied until now could justify it. Bad habits in our way of living, a food too much rich, a lack of physical exercises, a poor and week genetic, it’s probably a mix of every of those things, that could explain a gain of weight, but none of those defects would be the reason of an epidemic. Epidemic? That’s the world! The phenomenon is so gigantic that some scientists came to the conclusion that only a virus could justify such a fast development! Our societies are very confuse towards those problems of weight which are becoming worse despite nutritionals advises gave by great specialist. Since few years, a new hypothesis as simpler as revolutionary is presented by a nutritionist worldwide known, Loren Cordain (from Colorado University): Man is not genetically adapted to what he is eating. According to Cordain we suffer from being overweight but also from other diseases of civilization, because we do not eat the food matching our body and ours physiological needs. Only a real food revolution could bring us to the road of becoming thin, it’s a come back to the origins. Man didn’t always eat tagliatelle or crackers and strawberry yogurts … During the most big part of his history, he behaved like a hunter and a picker in others words he had eat what mother nature had plan for him, meat and plants … you will be able to lose weight by getting closer of the food of our ancestors hunters and pickers. Clean foods keep you lean! Have you noticed that when you attempt to go on a “diet” you end up losing a few pounds only to gain them all back plus five pounds more? Diet foods don’t’ make you leaner; they make you fatter than you already are! Want to know why? It’s all in the word “diet”. The word itself is a clever marketing tool causing people to buy the stuff and making them crazy because they confuse healthy eating with dieting. Diet products are often obese with chemicals, additives and sugar, leaving you void of nutrition. The word “diet” gives you false hope and the permission to give in to cravings and indulgences because at the end of the day you can always say, “Well, I ate diet chips and diet cookies”! diet foods don’t’ make you accountable – they make you fat. Contrary to common “diet” practices, including starving yourself and omitting entire food groups. Eating clean allows you to eat more and weigh less by making informed food choices. You eat five or six small meals a day by choosing from a cornucopia of lean proteins (LP) and complex carbs (CC) and by avoiding starchy sugary empty-calories, industrialized and high-fat foods. Eating several smaller meals of lean protein and complex carbs daily will fire up your metabolism, making you a highly functioning fat-burning machine. Your entire body will thank you and you’ll be amazed at how good you look and feel. 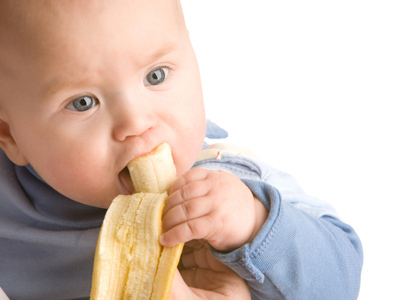 Eat like a baby, baby basics! A baby’s life is simple sleep, cry, eat, sleep, cry, eat, sleep, cry, eat, sleep, cry, eat, and a lot of elimination – you get the point. Notice how many times a baby needs to eat? Pay attention – you should be eating this often too. Going back to the “basics” – the “baby basics” of eating and sleeping (and perhaps crying if you need to) – is key to grasping the eat-clean diet way of life. When you eat clean, you know to eat every two to three hours to fuel a powerful, efficient, machine-like metabolism. If you don’t feel hungry or you tend to forget to eat, schedule it on the clock: 7am breakfast, 10am snack, 1pm lunch, 4pm snack, 7pm dinner and 10pm snack if you need one. Hungry or not, stick to this plan, your body will reset and as a result kick start your fat-burning abilities. 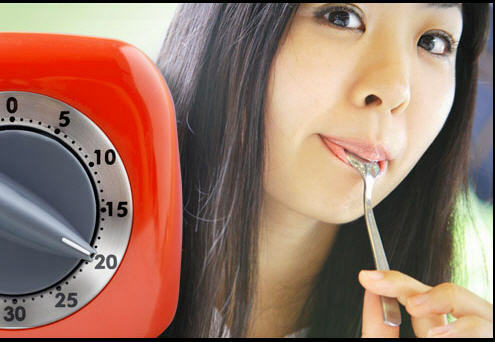 Before long you won’t need the reminder of the clock, your own body will tell you when it’s time to eat. Remember to fuel yoru body with lean protein and complex carbs, not high-fat, starchy, sugary, empty-calorie foods. you to to choose and purchase the fitting online game system in your home. creates an encrypted connection to a third-party server, and all your Internet traffic is routed through that server. lookup single people according to life-style preferences, age, gender and religion ethnicity and so on. for starting this up. This web site is one thing that’s needed on the internet, someone with some originality!